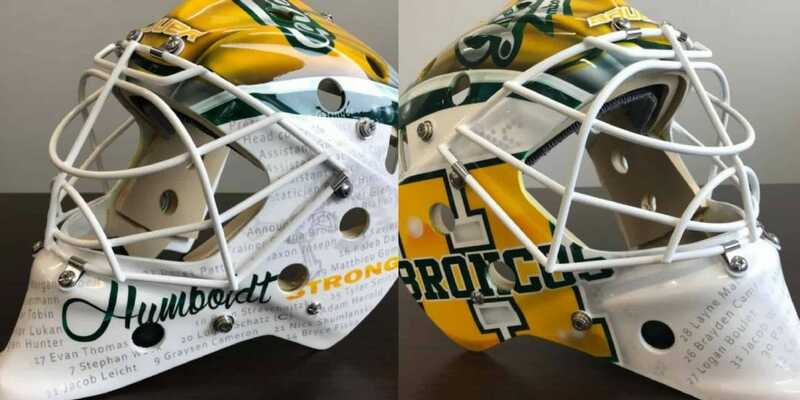 The Humboldt Broncos bus tragedy that claimed 16 lives hit close to home for goaltender Cody Porter, too close for him not to do something to try and help. So Porter, whose junior hockey career includes stints in the WHL and QMJHL as well as Junior A leagues in B.C. and Nova Scotia, commissioned a charity mask to honour those who were killed in the tragic accident, and is auctioning it off to benefit the victims and their families. 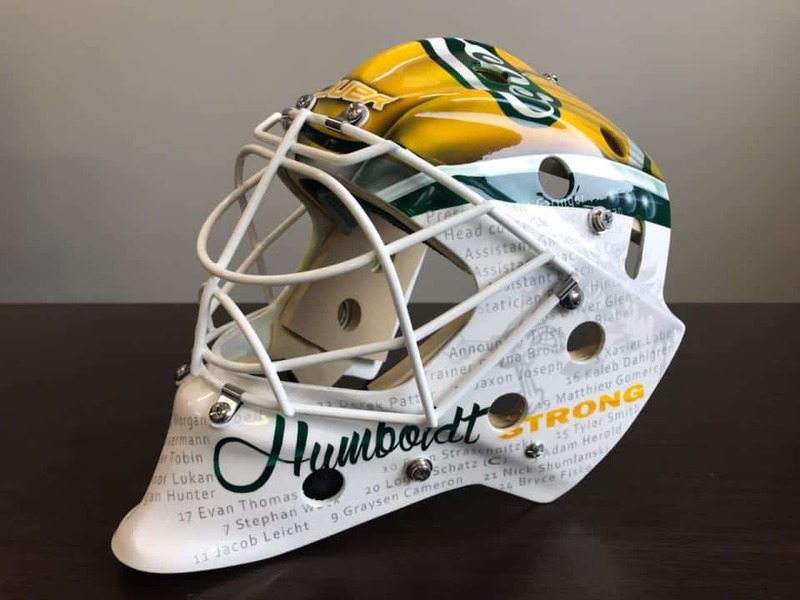 This mask, commissioned by Cody Porter, will be auctioned off to benefit the families affected by the Humboldt Broncos bus accident. Porter travelled to Humboldt, Saskatchewan to attend the vigil, to mourn the loss and support his friends. “When I was in Humboldt it was also the same time that I found out the news about the condition of both goalies, Parker Tobin [18 yrs old] was killed in the crash, the same kid that I had the privilege to go to a goaltending camp with a few years back, along with fellow goalie Jacob Wassermann [18 yrs old] who I found out is paralyzed from the waist down and will never walk again,” Porter said. The mask was donated by The Goalie Guild. 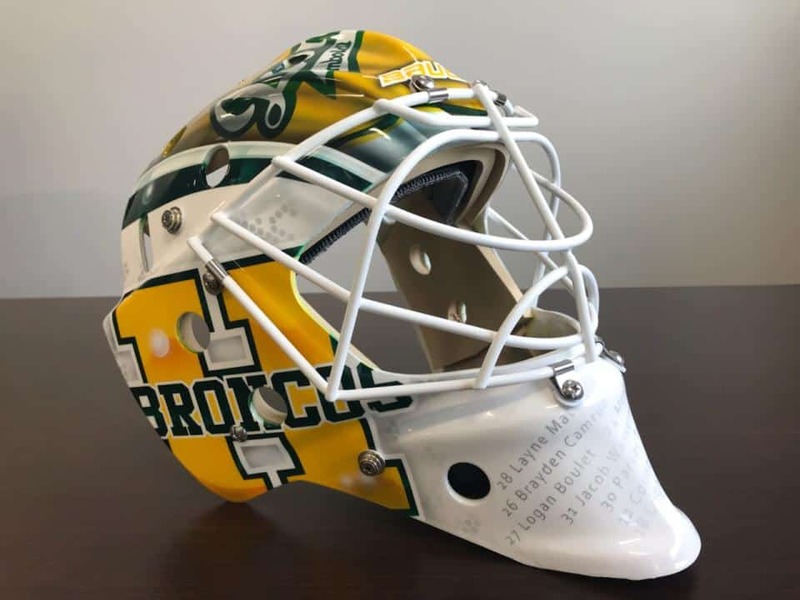 Porter got a mask donated by The Goalie Guild and commissioned his long-time personal artist Derrick Gilders to paint it with a tribute to the Humboldt Broncos, using the colors and logos and names of everyone who was on the bus and in the organization. It will be auctioned off, with the winner keeping the mask and 100 percent of the proceeds going to the families. The goal for the winning bid is $5,000. Porter is also accepting donations to that same email address on PayPal. The Go Fund Me account called Funds for Humboldt Broncos, which had raised close to $14 million dollars as of Wednesday morning, is being closed at midnight on April 18. 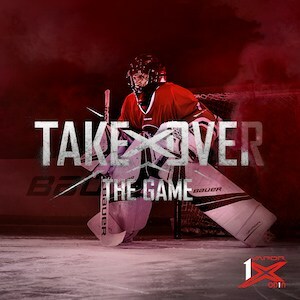 The funds raised will go directly towards facilitating goalie skill development, equipment costs, and educational pursuits. 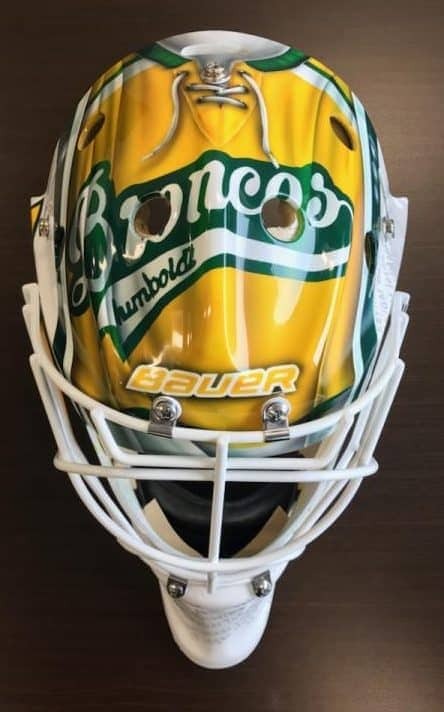 Brian’s Custom Sports created a set of custom Humboldt Broncos Optik gloves that is being auctioned off on eBay to support the Remembering Parker Tobin fund. InGoal Magazine is already in with a $1,000 donation to the fund, and encourages the rest of the goalie union to join in this, and Porter’s endeavours to commemorate those lost in the tragedy and help everyone else affected by it. Hard to put last night into words. When you think of a hockey arena you think of a place where people go to have fun, cheer and escape from day to day life. Last night was the opposite of that. It was the saddest arena I’ve ever been to in my entire life. Seeing the parents and families of these players crying on the ground in front of their sons photos put me in tears. Hearing all of the stories about that tragic day on HWY 35 and seeing a tight knit community of very strong individuals that I had the privilege to talk to come together in sorrow was unlike anything I’ve experienced before. Seeing and talking to some of the survivors on the team and how emotional this whole disaster is especially for them and everyone involved makes you feel sick to your stomach. Having been one of only 2,000 people in the world that had the privilege to pay tribute last night in Humboldt at the Elgar Petersen Arena live I feel very honoured to have been able to be there and it definitely made everything seem that much more real. The one thing that was preached a lot is that we all need to look for the good in each other and not worry about the little issues we have with someone as well to never take a second of life for granted, as said last night “ we are all living only one breath at a time, we live on vapours”. I hope some way and some how we can find peace out of this. It’s amazing how everyone comes together when we really need each other. To the over a thousand people that sent me a private message yesterday asking for a prayer in the arena on your behalf it was definitely heard. Let’s all keep Humboldt in our thoughts and prayers and always remember to do more for others than you would for yourself! #humboldtstrong #weallstandtogether #onebigfamily ??????????????? ?